Footprintz stroll into the summer with some of the most sun drenched beats I've heard all year. 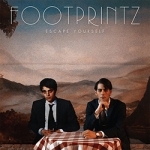 Having already delighted us with nu-disco hits of huge singles Utopia, Dangers of the Mouth and The Favourite Game their debut album Escape Yourself is a sure fire hit this year. It's an album bursting at the seams with catchy hooks - The Things That Last Forever, The Invisible, Uncertain Change, The Fear of Numbers and scorcher Zanzibar all adding to a quality LP along with the singles. Clarian North and Adam Hunter have been making music together since high school. You can feel the warmth of the sun on your skin with very beat. A utopian delight from start to finish, highly recommended.